It is second against third for Rugby Town in the UCL Premier Division on Saturday, when Valley make the trip to Lincolnshire to face Pinchbeck United. 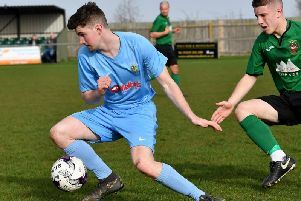 The two sides swapped places last weekend after Town maintained their perfect home league record to-date with a 4-0 win over Sleaford, whilst Pinchbeck were suffering a 6-3 reverse at Newport Pagnell. Those results meant that Rugby now enjoy a two point advantage over United, with Daventry holding a nine point lead over them at the top - albeit with Town’s local rivals having played two more games. Rugby boss Carl Adams confirmed he was a happy man at the moment. He said: “Things are going well - we are winning games comfortably, scoring lots of goals and not conceding that often, so the spirit in the squad is understandably high. “It’s a big game this weekend as it gives us an opportunity to put some real daylight between us and Pinchbeck - who have had a bit of a tough time of late. Saturday’s hosts have won just once in their last five outings in all competitions - including a 6-0 defeat at Daventry last month which ended their unbeaten nine game start to the 2018/19 league campaign - coming on the back of consecutive promotions in the two previous years. Town’s victory over Sleaford extended their run of league games without a loss to seven, with five of the six wins included within that seeing them score four times. Adams had signed Fazel Koriya ahead of the weekend fixture at Butlin Road, with the veteran attacker returning to the club for the third time in the process. As with other recent signings Liam Francis and Trey Brathwaite, Adams had hoped to get Koriya on-board in the summer, but the ex-Rushden & Diamonds man opted to stay with Newport Pagnell for whom he had scored more than 30 goals last season. Koriya marked his latest Town debut with a late penalty against Sleaford to take his Valley career goalscoring tally to sixteen, after two spells at Butlin Road under Dave Stringer between 2012 and 2015. Adams continued: “It’s great to finally get Fazel over the line, as he has a great record in this league. 17-year old-Steele made an assured league debut at the weekend, after first choice left-back Brathwaite was ruled out with a thigh injury, with the Academy captain having a hand in Town’s third goal mid-way through the second half. Valley will be without Lewis Hayden this Saturday after the midfielder picked up a fifth yellow card of the season against Sleaford, with fellow midfielder Stefan Blake also struggling with a thigh problem which saw him withdrawn at half-time on Saturday. Danico Johnson managed to avoid a fifth booking though to ensure he is available for the game at Spalding United’s Sir Halley Stewart Field ground, but he did continue his excellent scoring record with an early strike - his 19th of the campaign so far. Adams confirmed that the centre-forward had turned down the latest approaches made to him by NPL Premier Division Hednesford and Southern League Premier Division Redditch respectively. # The club coach to Pinchbeck leaves from outside Rugby School at 11am and then picks up at the Clifton Inn at 11.15am. For latest information contact Tony Mann on 07970 691366.